Please note that the content of this book primarily consists of articles available from Wikipedia or other free sources online. Kum rasambhava is an Sanskrit epic poem written by the illustrious poet K lid sa. 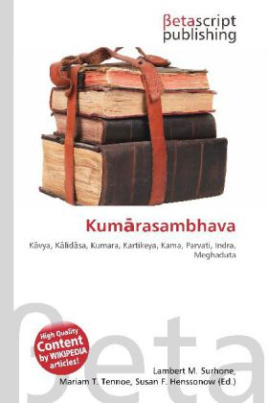 It is one of the most important examples of K vya poetry.Kum rasambhava literally means "Birth of Kumara", i.e. Kartikeya. This epic of seventeen cantos entails Shringara Rasa, the rasa of love, romance, and eroticism, more than Vira rasa (the rasa of heroism). Tarakasur, a rakshasha (or demon) was blessed that he could be killed by none other than Lord Shiva''s son, however, Shiva had won over Kama-deva (the god of love). Parvati performed great tapasya (or spiritual penance) to win the love of Lord Shiva. Consequently, Shiva and Parvati''s son Kartikeya is born and kills Tarakasur to restore the glory of Indra, the king of Gods.